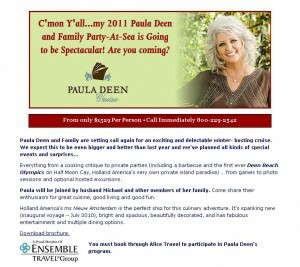 Paula Deen has a cruise, everyone! It’s $1529 a person! Included for no extra cost are the Deen Beach Olympics, which I can only imagine is a lot of ham throwing! Thanks to the illustrious Oliver Thring for unknowingly tipping me off. Posted in Meatball | Comments Off on A Pounda Cruise, Y’all. Only the most sour-faced leftie would refuse a Pimm’s: it evokes the other Eden, demi-paradise version of England: the languid days on level croquet lawns; the plock of leather on willow; splashing, passing oarsmen; the Glastonbury chumminess of Henman Hill. I first tried it as an undergraduate at Oxford (I can feel the comment love already) and I never taste it today without remembering those sunlit, sozzled days. Ahhhh christ. I just… I could… I mean, reading this is like… oh, he’s just a modern-day Jane Austen, isn’t he!?! Posted in Meatball | Comments Off on Consider Pimm’s! It was all horrible. Laughing Cow smells alarmingly of nothing. On the tongue, it’s clammy and cold, chilled snot whiffing of silage. Dairylea is epically disgusting: baby-sick panna cotta. Cheestrings – technically not processed, but a heated, elongated cousin – sent me their “shots” to try: lentil-sized lumps that looked like Brian May’s dandruff. Oliver Thring in Consider Processed Cheese on The Guardian today. Chosen explicitly for the superfluously creative (read: borderline disgusting) language in insulting processed cheese. And by the way, I do not approve of dissing Brian May. Posted in Meatball | Comments Off on Consider Processed Cheese!